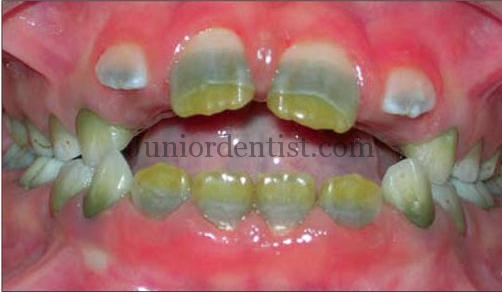 Chromogenic Bacteria cause Yellow/Green/Orange stains on the teeth in children. The Stains can be seen in Newly erupted teeth as well. We can see in the image that the incisal edges of the teeth are Green and the middle third of the teeth is Stained Black. Green color is due to the Chromogenic Bacteria and the Black color is due to many factors like plaque accumulation, chlorhexidine, stannous fluoride, tobacco etc which is seen mainly in adults. When do Chromogenic Bacteria cause stains ? Chromogenic Bacteria cause stains mostly when the child has received Liquid Amoxicillin for a prolonged period of time. The intake of liquid amoxicillin during the development of the teeth is known to cause the green color stains and the Chromogenic Bacteria which is the cause of the discoloration is “Serratia Marcescens”. Chromogenic Stains are a type of Extrinsic Stains of the teeth which are seen in children and these stains can sometimes be intrinsic if the bacteria affect the tooth during development stage. Chromogenic stains can be seen mostly in the incisal edges as seen in the image. The black stains which are present in the cervical region are due to the bacteria present in the gingiva. Along with the Chromogenic bacteria there are man other causes of discoloration of teeth which range from deficiencies, drugs, developmental deficiencies, medical conditions etc which have been listed in this detailed post about – Anomalies of Color of Teeth. It is very important to identify the exact cause of the discoloration to help in determining a proper treatment plan for the condition which is varied based on the amount of discoloration and the extent of it. The discoloration if internal is permanent and aggressive therapy is required such as going for Crowns (Zirconia or Metal Ceramic) or Veneers if the discoloration is mild, in case the discoloration is superficial aggressive treatment is not necessary and simple cleaning and use of Composite restoration or Veneers can be useful in improving the Aesthetics of the affected teeth.